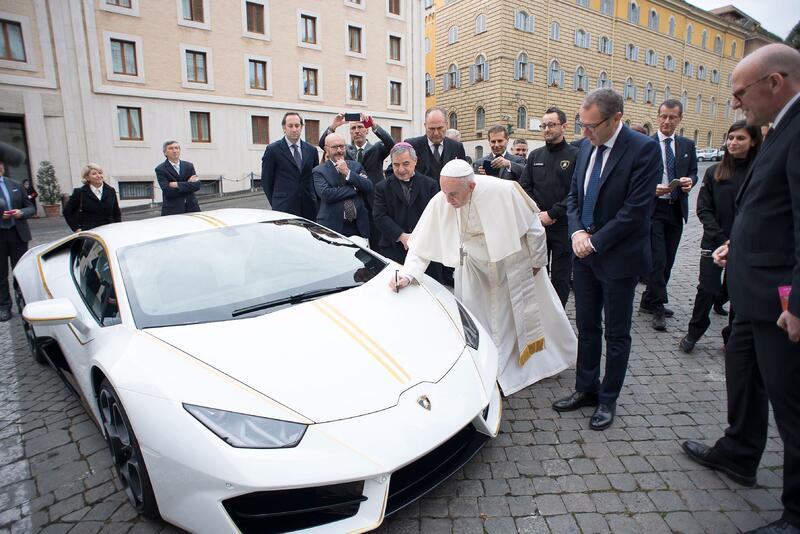 VATICAN CITY -- Luxury sports car maker Lamborghini has presented Pope Francis with a brand-new, special edition Huracan that will be auctioned off with the proceeds donated to charity. Lamborghini officials presented the sleek, white car with yellow-gold detailing to Francis on Wednesday in front of the Vatican hotel where he lives. The pope promptly blessed it. Some of the funds raised from the Sotheby's auction will go to rebuilding Christian communities in Iraq devastated by the Islamic State group. The Vatican said Wednesday that the aim is to allow displaced Christians "to finally return to their roots and recover their dignity." Base prices for the Huracan, introduced in 2014, usually start at around 183,000 euros. A special edition built for a papal charity would be expected to fetch far more at auction.